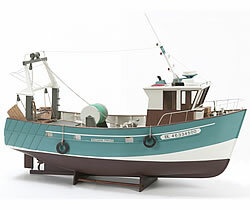 Billings Boats BIL534 Boulogne Etaples-Stern Trawler 1/20 scale wood ship kit! This original design can be seen in many ports along the French Channel. The boats are socalled stern trawlers, in which the net is pulled in using a tricing line in the rear of the boat. The hull is of steel; and the length is 11 m.